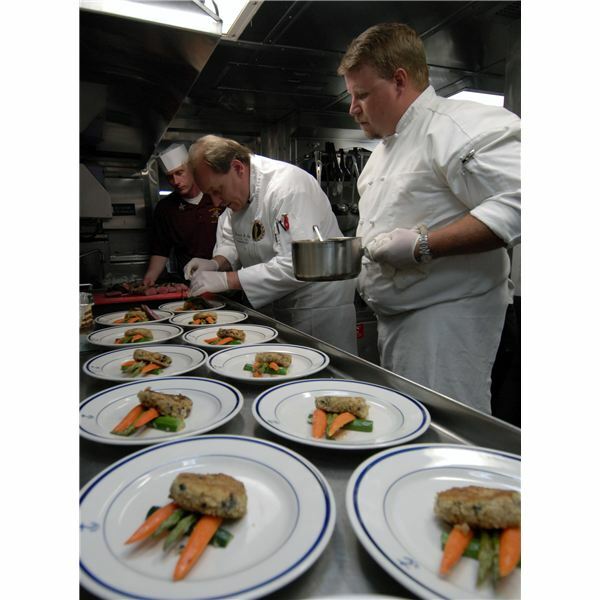 Chefs and head cooks remain responsible for the daily food service operations of a restaurant or other establishment that serves food. They develop and prepare recipes, plan and price menu items, direct the cooking process done by junior cooks in the kitchen, order supplies, and deal with other food-related concerns, besides participating in the actual cooking process at times. How much money does a chef make annually? The Bureau of Labor Statistics May 2009 Occupational Outlook Survey estimates a total workforce of 94,300 chefs in the US, earning median hourly wages of $21.27 and median annual wages of $44,420. Those at the bottom 10 percentile earn $10.99 a month or $22,860 a year on average. Those at the bottom 25 percentile earn $14.46 an hour or $40,090 a year on average. Those at top 25 percentile earn $25.73 an hour per $53,510 annually, and those in the top ten percentile earn $33.34 an hour or $69560 a year on average. The American Culinary Foundation (ACF) survey conducted in 2008, placed the average salary for a certified executive cook at $54,100 a year, with chefs holding higher certifications usually earning $10,900 more annually, compared to chefs without such qualifications. Six percent of chefs earn more than $100,000 a year, and eight percent of chefs earn less than $20,000 a year. Thirty-eight percent of chefs earn between $20,000 to $49,999 a year, and almost half the chefs receive an annual salary of between $50,0000 and $99,999. How Much Does a Chef Make Based on the Industry? How much a chef makes varies greatly depending on the state, metropolitan area, and type of employer. The best paying jobs for chefs are with upscale restaurants and hotels in metropolitan and resort areas. Among sectors, the management of companies and enterprises, employing 580 cooks pays an average hourly wage of $32.25, and average annual wage of $67,070, making them the highest paymasters of chefs. The largest employers are however full time restaurants, employing 48,340 chefs and providing them with average hourly wages of $20.07, and an average annual wage of $41,750. Travel accommodations that employ 11,290 chefs, offer better pay at $24.46 an hour, or $50,580 a year, on average. How Much Does a Chef Make Based on Area? How much money does a chef make annually among states and metropolitan areas? The best state for chefs is New Jersey, where 1900 chefs find employment at average wages of $28.42 an hour and $59,120 a year. Nevada employs 2670 chefs, making it the state providing maximum employment opportunities for chefs. Average hourly wages in Nevada are $21.94 and average annual wages $45,630. The next best state, Idaho employs only 1230 chefs at $12.05 an hour or $25,060 a year, on average. The next three top states in terms of employment opportunities are Alaska, New Hampshire, and Hawaii, whereas the next three top states in terms of average salaries are Rhode Island, Delaware, and Virginia. Opportunities in Hawaii, employing 900 chefs and offering average wages of $23.96 an hour or $49,830 a year, strike a balance between employment opportunities and pay. The best metropolitan area for chefs is the New York-White Plains-Wayne, NY-NJ Metropolitan Division, where 3140 chefs find employment at $38.91 an hour, or $80,940 a year, on average. The Las Vegas-Paradise metropolitan area, NV employs 2280 chefs at $22.14 an hour or $46.050 a year, on average. The Bureau of Labor Statistics puts the total workforce of chefs, head cooks, and food preparation and serving supervisors at 941,600. Employment prospects may grow by 6 percent through 2018, which is lower than the average for occupations overall. A reason for such low growth could be how much a chef makes compared to many other top paying jobs.